What factors have increased the U.S. national debt? As you probably know, when Bill Clinton left office, the budget was in surplus and both the White House and the Congressional Budget Office projected that the external U.S. debt would be completely repaid by about 2010. Instead, we're more than $12 trillion dollars worse off. In an earlier post I referenced a New York Times graphic that breaks down some of the policy changes contributing to the bad news. I've long been a fan of James Fallows at The Atlantic Monthly, and his blog posts yesterday and today on the very same graphs are worth reading. Update 2017 February 9: The White House page holding the graphic above has been deleted by the new administration, but the Obama-era website has been preserved by the National Archives here, and I have adjusted the "another chart" link above the graphic to point to the archival site. Update 2017 February 9 and April 20: This post was originally published in mid-2011. Since then the total national debt has continued to increase every year. When spending exceeds what the government takes in in taxes and fees, we have a budget deficit. 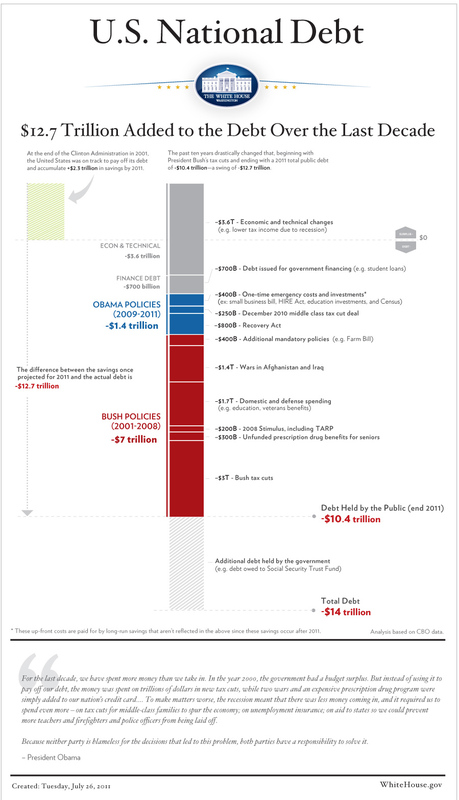 A deficit is covered with additional borrowing, so the deficit represents the amount of increase in the national debt. The annual deficit fell during the Obama years from 9.8 percent of gross domestic product in fiscal 2009 to 3.2 percent in fiscal 2016. (See this interactive chart from the St Louis Fed.) But the deficit was higher in 2016 than in 2015, and based on current proposals from President Trump it is likely to increase further. See also this post about support for a growing deficit among many congressional Republicans. The U.S. most recently ran a budget surplus -- and started paying down the national debt -- during the last years of the Clinton administration. George W Bush's tax cuts put an end to that, as noted above. The next most recent surplus budget was the final one passed under President Lyndon Johnson at the height of the War on Poverty, the War in Vietnam, and the Apollo Program. Update 2018 January 10: As you probably know, the Republican tax law passed late last year is projected to increase the national debt by an additional one or two trillion dollars over the next decade, owing to deep tax cuts for corporations and the wealthy and more modest one for the middle class. (Unlike the corporate changes, however, the individual tax cuts are time-limited.) The law was created with little to no public debate, so the consequences are still being analyzed. See this blog from the Institute on Tax and Economic Policy for the latest information. Defenders of the law argue that it will stimulate the economy enough to generate additional taxes high enough to cover the additional debt. The same promises were been made about past tax cuts for the wealthy under Presidents Reagan and George W Bush, but they've never come true.